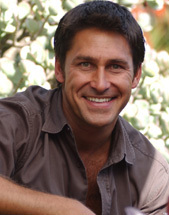 Jamie Durie is a qualified horticulturist and landscape designer and founder of the international award-winning design company PATIO Landscape Architecture and Design. He was also the host of The Victory Garden on PBS. He has authored five books, PATIO—Garden Design and Inspiration, The Outdoor Room, The Source Book, Outdoor Kids, andInspired. Two of these titles are released under his own publishing company, Jamie Durie Publishing. Jamie is undoubtedly one of Australia's most recognizable talents, having hosted many of Australia's top-rated programs including Backyard Blitz, The Block, Torvill and Dean's Dancing on Ice, and Skating on Thin Ice. However, it was in his role as host of the television series Backyard Blitz where he first captured and inspired the imagination of the Australian public, making gardening "hip" again. The successful garden makeover show received six consecutive Logie Awards for Most Popular Lifestyle Program. Born in Manly, North Sydney, Jamie spent most of his childhood in the Western Australian outback mining town of Tom Price. With his mother and grandmother both Sri Lankan (born in Galle and Kandy respectively), he has inherited a love of the Sri Lankan culture and lifestyle. Like his father, and all Australians, he loves the outdoors and is passionate about nature and creating the ultimate outdoor living space. His inspiration comes from the vast natural beauty of the Australian landscape, years of extensive international travel, and his passion for protecting the environment. He successfully combines these raw elements to create his own unique style in his garden designs and has truly pioneered the concept of "The Outdoor Room." A best-selling author, publisher, and television host, Jamie also designs his own successful line of innovative and fashionable gardening and outdoor living merchandised product, PATIO by Jamie Durie. This product line is available exclusively through Australia and New Zealand retailing giant Kmart. An advocate for preserving our natural surroundings and environmental future, Jamie is an ambassador for Planet Ark's National Tree Day and sits on the board of the Royal Botanic Gardens Foundation in Sydney.